Le French GourMay's French Traditional Gourmet Market is back to PMQ. Join us on this 3-day opening event of Le French GourMay - Loire Valley edition! 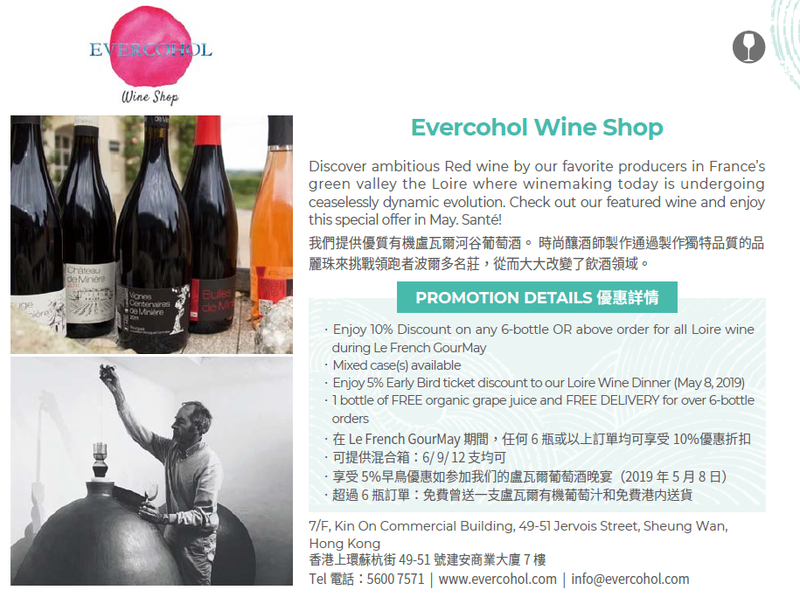 Le French GourMay is the one and only major festival in Hong Kong and Macau dedicated to gastronomy à la française, organised under the umbrella of Le French May Arts Festival. French cuisine is one of the few UNESCO-listed culinary cultures in the entire world. Each year, we celebrate this unique culinary treasure in collaboration with one French region. For the 11th edition in 2019, we will showcase the wonders of a stroll along the LOIRE VALLEY. From 1 to 31 May 2019, Le French GourMay will pair the appetite of the gourmets in Hong Kong and Macau with the historic towns, royal residences, serene landscape from the river to the Atlantic Ocean. For an entire month, you are invited to join us on this voyage of special menus in our impressive network of partner restaurants in Hong Kong and Macau, specially prepared by Michelin-starred chefs, fine dining restaurants and bistros. Special offers on food and wine shipped to you from the Loire Valley are to be discovered in grocery shops and wine shops. The more hands-on experiences of wine tasting and culinary workshops will be available at partnering learning centres. Loire Valley has a wine-growing history of more than 2,000 years. In this third largest wine region in France, the vineyards are nourished by Atlantic breezes, and a mosaic of micro-climates, soils and geographic features. Loire Valley wines share important characteristics that make them perfect for contemporary taste. Loire Valley contains several distinct wine regions, each with its own characteristic grapes, appellations* and styles, ready to welcome you to discover all their diversity. This terroir is also blessed with excellent produce that go wonderfully well with its wine. White wine like Sancerre or Savennières blanc to pair with a dish of zander in beurre blanc sauce; red wine like Saumur Puy-Notre-Dame or Saint-Nicolas de Bourgueil with rib steak from the region’s farm beef; or a glass of Crémant de Loire or Coteaux du Layon with a brioche-based dessert. Cheese is another not-to-miss of Loire Valley, with Sainte-Maure de Touraine being a beautiful example, which goes perfectly with Touraine blanc sec or a communal cru Muscadet. Other cheeses exemplifying the regional savoir-faire are notably Chavignol, Pouligny-Saint-Pierre, Selles-sur-Cher and Valençay, etc.